There are few things more disgusting than having to clean up a house or apartment that been saturated to the core with cigarette or another tobacco smoke smell! If you’ve ever spent time around a smoker, you know the odor lingers – long after they’ve left the room. But for homes or apartments where smokers lived, that nasty odor can stay for years. The reason is simple; smoke gets everywhere! From deep in the carpet, to furnitures and windows coverings – it hangs in the air, sticks to walls, ceilings, and and floors, as well as kitchen cabinets, and it even gets trapped deep inside heating ducts where it can spread through your entire house! If you’ve found yourself stuck with a smelly abode to live in, rent, or sell, here’s how to remove the stink and clear the air. The first step to deep cleaning process is to understand what we’re dealing with. When cigarette smoke floats into the air, it spreads out and sticks to whatever it touches. What doesn’t stick to surfaces, walls, and the ceiling will eventually settle back down onto the floor and into the carpet. These particles are then ground in with our feet when we walk. On light-colored surfaces, this patina of cigarette residue is faintly yellow, growing more intensely yellow with layers and time. Now that you know what you’re dealing with, prepare to blast that tobacco smoke smell and yellow residue from every surface and material in the home. Start by working from top to bottom on all furniture, counter, cabinetry etc. Mix up a solution of TSP (trisodium phosphate) which is a soapy cleaner found in hardware stores of the paint esile of your favorite home improvement superstore) and use a combination of moist paper towels and soapy sponges to get every hard or smooth surface in the house. Change the towels frequently so that you don’t end up spreading the smoky residue around. Get into corners, undersides, and especially the upper areas where smoke tends to linger. Another way to get to the hard to reach places is buy using a sponge mop. Get a brand new one that’s never scrubbed a floor, and get it damp with the clean soapy (TSP) water and scrub away, making sure to rinse it frequently and change the soapy water often. Even after the walls and ceilings are thoroughly cleaned, there will still probably be some lingering tobacco smoke smell left. Drywall is paper faced and will absorb that odor to a depth where all the scrubbing in the world won’t remove. Plus, textured ceilings are particularly impossible to clean and you certainly can’t scrub them effectively. That’s why the next best step is painting, but not just with another top coat. If you really want to wipe out the smell, you’ll need to prime the walls and ceilings with preferably an oil-based primer like KILZ. Even though primers are available in latex formulas, I have found that only the oil-based really does the job of permanently sealing in the tobacco smoke smell odor. Once the primer has dried, you can apply a latex top coat color of your choosing. The carpets are often the most long-suffering victims of a smoking habit and the carpets in homes with smokers tend to get unpleasantly matted and sticky. There are two ways to approach this problem. First, if you think the carpet is worth saving, rent a steam cleaner and be prepared to go over each section ten or more times before the solution sucked back up into the waste tank is white and sudsy instead of brown and gross. Just like walls, carpets are very absorbent. Not only will the odor saturate the carpet itself, but it will grab hold of the padding, as well as the sub-floor below! That’s why unless there’s a very compelling reason ot keep the carpet, its best to remove the carpet and padding, and then clean and paint the subfloor, as described above, using an oil-based primer to completely seal in any reminaging smoky stink! Finally, and here’s something many people forget, there’s still a tone of nicotine-infused dust hiding in your air ducts and clinging to your vents. 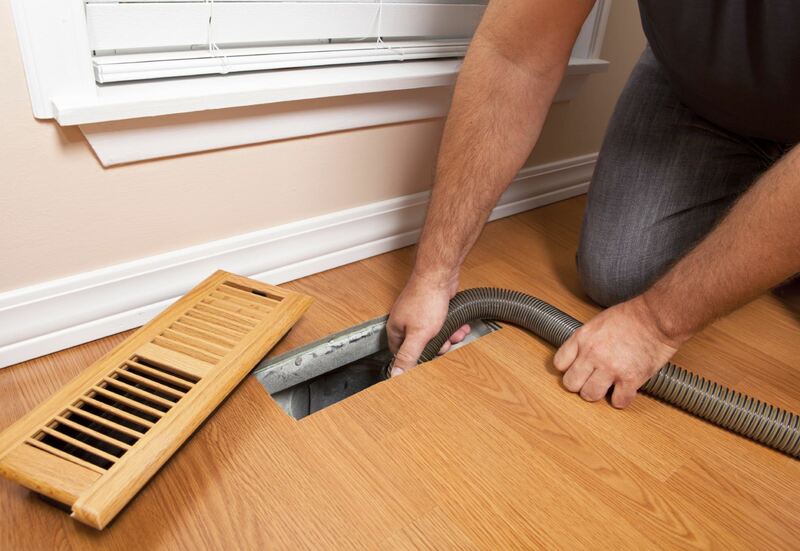 Pull down the vents and was them by hand, replace your AC and furnace filters, then clean your ducts with a stiff brush or, if you’d prefer, call a professional to do it for you. This will ensure that the final remnant of old stale cigarette smoke is completely gone. With clean surfaces, fresh paint, and gleaming ducts, your home is finally rid of the tobacco smoke smell and ready to house a non-smoking family. Whether this effort has been for your health and happiness after a quit or you’ve simply found yourself in charge of a nicotine-tinged house, with a complete and thorough deep-clean, even a home that has been smoked in for 50 years straight can be restored to clean hypoallergenic perfection.